Luca Badoer (born 25 January 1971) is an Italian former racing driver. Badoer has raced for the Scuderia Italia, Minardi, Forti Corse and most recently, Ferrari teams. In addition to his racing duties, Badoer was one of the active test and reserve drivers for Ferrari from 1998 to 2010 and in 2009 stood in for Ferrari's regular race driver Felipe Massa at the European Grand Prix and the Belgian Grand Prix after the Brazilian was injured during qualifying for the Hungarian Grand Prix and his original replacement, Michael Schumacher, pulled out due to injury. 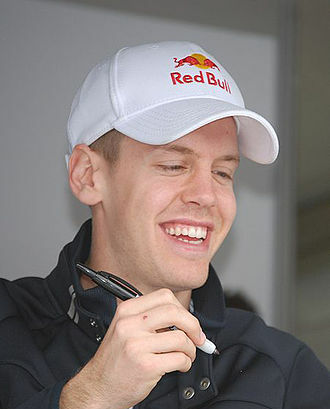 As of September 2011[update], Badoer holds the record for the most Grand Prix starts – 50 – and the most race laps completed – 2364 – without scoring a point, although all of his races before his 2009 comeback came during a period when only the top six finishers scored points. Under the 2010 scoring system, he would have scored 26 points over his career. He nearly achieved a points finish in the 1999 European Grand Prix when a strong drive saw him reach fourth place, but the gearbox on his Minardi failed with 13 laps remaining. 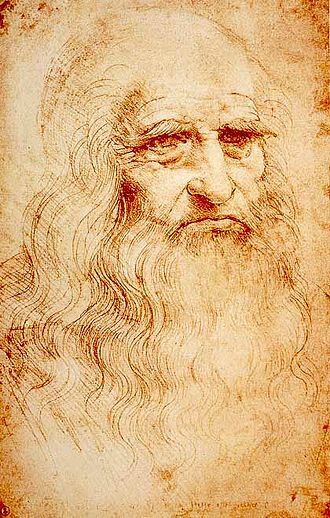 Badoer was born in Montebelluna, Veneto, Italy. He raced karts in his youth starting in 1985 and scored two wins. In 1986, Badoer drove in the 100cc category to become the karting champion of Venice and became national champion the following year. He won the Italian championship in the 100cc international class in 1988. In 1989, Badoer moved to single-seater racing, joining the Trivellato team in the Italian Formula Three Championship driving a Dallara/Alfa Romeo that followed a move to MRD in 1990. Driving a Ralt RT33 Alfa Romeo, he defeated Alex Zanardi and Roberto Colciago to win the final race of the 1990 season and finished 10th in the championship. In 1991 he moved to the Supercars team driving a Dallara 391 Alfa Romeo to win four races in succession, but was disqualified after a technicality concerning his tyres. Badoer finished 4th overall taking 33 points. For 1992 he was picked to drive by Crypton Engineering for the Formula 3000 Championship, in which he emerged as champion, winning four races en route to the title. His debut Formula One season in 1993 was mired by BMS Scuderia Italia's uncompetitive Lola chassis, which, despite Ferrari engines, was the slowest car in the championship in terms of qualifying pace. In South Africa, Badoer retired after 20 laps due to gearbox failure. In Brazil, Badoer qualified 21st and finished 12th after an incident forced him to pit for a new nose cone. At Donington, he fell victim to a new rule limiting qualifying to the fastest 24 cars (his time was only good enough for 26th). The round at Imola saw Badoer race as high as sixth, but finish seventh. This remained Badoer's best result in Formula One. 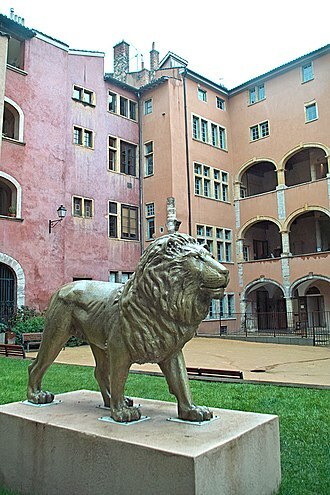 In Spain, he was unable to finish and at Monaco, Badoer finished the last of the runners. He managed to finish 15th in Canada. At Magny-Cours, Silverstone, Hockenheim and Budapest, Badoer failed to finish, twice to suspension failure. Going into Spa, the Lola team was gaining reliability and Badoer finished 13th. At his home race at Monza he was ahead of Christian Fittipaldi and battled for several laps before the Brazilian hit Badoer's car and eventually finished 10th. At Estoril, Badoer finished 14th after starting last. After the race, Lola did not travel to the races in Japan and Australia after the team announced they were to merge with Minardi in 1994. Benetton offered both Alboreto and Badoer tests in their cars to see who would partner Michael Schumacher for 1994 but Benetton chose JJ Lehto and Alboreto went to Minardi to line up alongside Pierluigi Martini while Badoer became Minardi's test driver. Badoer took over Alboreto's seat after the former retired. In the underfunded team using a Ford V8 after a deal with Mugen-Honda fell through, he started with a gearbox failure in Brazil with a good qualifying in Argentina. During the race, Badoer collided with the back of Mika Salo's Tyrrell and hit Rubens Barichello's Jordan later on bringing out the red flag. Badoer did not make the restart, having no spare chassis. His best results were eighth places in Canada and Hungary and ninth in Japan. In 1996 he switched to Forti Corse to be teammates with Andrea Montermini after Pedro Diniz left to join Ligier. During the season, he was only able to qualify for six of the ten races the team entered. In the 1996 Argentine Grand Prix Badoer was involved in a heavy collision with Diniz, whose Ligier struck him from behind and flipped his Forti upside down. He emerged from the collision unhurt but Argentine safety marshals were heavily criticised for failing to assist Badoer in a timely manner because they feared a fire would break out. At Imola, Badoer had a newer car and outqualified Montermini by more than a second. He finished 10th and the last of the runners. In Monaco, Badoer remained at the back and collided with Jacques Villeneuve at Mirabeau forcing both drivers to retire. He did not qualify in Spain but started 20th in Canada. In France, Badoer started ahead of Eddie Irvine after the Ferrari was relegated to the back. Forti Corse folded after that year's British Grand Prix. In 1997 Badoer moved to the new FIA GT Championship, driving a Lotus Elise GT1 for GBF Engineering with codriver Mimmo Schiattarella. At Hockenheim and Silverstone, Badoer retired with his form improving in Helsinki where he finished 20th. Schiattarela and Badoer retired in Nurburgring and Zeltweg with the pair finishing 12th at Donington completing 151 laps. A race at Mugello saw Badoer retire with loose bodywork. While driving for GBF, Badoer was hired as Scuderia Ferrari's test driver, a role he maintained until 2010. Badoer returned to Formula One racing in 1999, again with the Minardi team. At Melbourne, Badoer raced as high as fifth at some point until gearbox problems forced him to retire with 15 laps to go. Prior to Brazil, he suffered a testing accident which left him with a broken hand. Stéphane Sarrazin took his seat for the race. He returned for Imola with his hand still causing problems but managed to finish eighth. He suffered from gearbox problems and a spin in Monaco and Spain. In July, Ferrari's number one driver Michael Schumacher broke his leg in an accident at the British Grand Prix at Silverstone. 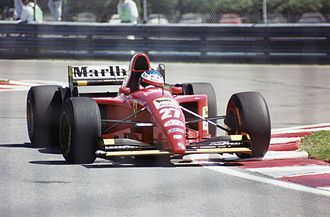 As Ferrari's test driver, Badoer expected to be promoted to the race seat in Schumacher's absence, but the team opted for Mika Salo instead, prompting criticism from former Ferrari driver Jean Alesi, who had himself turned the position down. His best chance to score points came at the chaotic 1999 European Grand Prix, only for gearbox failure to take him out 13 laps from the end when he was running in fourth position; teammate Marc Gené was promoted to sixth as a result (he would finish there to score the point widely believed to be the deciding factor in the 1999 Drivers' Championship, holding off Ferrari's Eddie Irvine after McLaren's Mika Häkkinen had passed him following a car failure that took Jacques Villeneuve out from fifth position). Badoer was so upset he broke down in tears after climbing out of the car. Badoer overall started 48 races for backmarkers Scuderia Italia, Minardi and Forti Corse between 1993 and 1999. Badoer was dropped in favour of Giancarlo Fisichella after the 2009 Belgian Grand Prix. 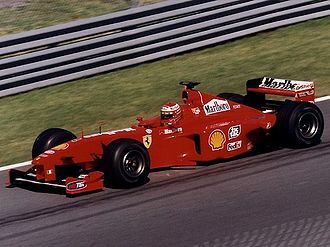 Unable to find a satisfactory race seat in Formula One after 1999, Badoer focused on his job as the permanent test driver for Ferrari, covering thousands of kilometres at the Mugello and Fiorano test circuits each year. He is credited with making a vital contribution to Ferrari's first Formula One Drivers' Championship win for 21 years in 2000. At the opening ceremony of the 2006 Winter Olympics in Turin, Badoer demonstrated one of the team's 2005 cars in the centre of the stadium. After the pit crew assembled the car, Badoer revved the engine, and performed several doughnuts, creating a large cloud of tyre smoke and leaving circular black marks on the white platform. On 11 August 2009 it was confirmed that Badoer would return to Formula One racing after almost 10 years, to replace the injured Felipe Massa at the 2009 European Grand Prix in Valencia. Massa was injured during the qualifying session for the 2009 Hungarian Grand Prix when a piece of suspension fell from the rear of Rubens Barrichello's Brawn GP car and struck Massa's helmet, fracturing his skull, knocking him unconscious and causing him to crash into a tyre wall. Michael Schumacher was set to replace Massa, but a neck injury Schumacher sustained in a German superbike test earlier in the year forced him to pull out. Ferrari confirmed that Badoer (Ferrari's longest-serving test driver) would replace the injured Massa instead. The BBC reported that Badoer was given the job as a "thank you for his commitment to the team". His previous Formula One appearance was in the 1999 Japanese Grand Prix, where he qualified last and retired late in the race. While Badoer had waited almost 10 years since his last drive, this gap is shorter than the 10 years and three months between Jan Lammers's appearances at the 1982 Dutch Grand Prix and the 1992 Japanese Grand Prix. In the first practice session for the 2009 European Grand Prix at the Valencia Street Circuit, where he had never driven before, Badoer came last and was three seconds off the pace of fastest man Rubens Barrichello and 2.5 seconds down on team mate Kimi Räikkönen. He was 1.3 seconds down on Räikkönen in second practice, and 1.9 seconds off in final practice. He qualified 20th and last for the race, with a time almost 1.5 seconds slower than Scuderia Toro Rosso driver Jaime Alguersuari, who was 19th. He was also caught speeding in the pit-lane four times during Friday practice. These offences earned him a reprimand and three separate fines totalling €5,400. Badoer explained: "I am used to a 100kph limit in testing and so when I pressed the speed limiter button at the usual point in the pitlane, it did not give the car enough time to slow to the right speed". A number of drivers defended Badoer's performance. Lewis Hamilton said: "I think he's done a good job. He's not put it in the wall. He's kept it on the track. It's an incredibly tall order to jump into the footsteps of Felipe Massa. He hasn't even raced for ten years, so I think anyone who has taken that long out of the car is going to struggle, but instead I think he has done a good job just to keep it on the track and bit-by-bit he will catch up". Heikki Kovalainen stated, "I don't know what else you could have expected. Sometimes the tyres warm up, or they overheat or they don't warm up, and it's much more complicated than a few years ago where they brought out tyres that worked straightaway in different conditions. I think that knocks the driver's confidence very easily – if the tyres are not working 100 percent you can't push if you don't feel you have the grip". In racing at Valencia, Badoer became the first Italian to drive for Ferrari in 15 years. BBC commentator and former F1 driver Martin Brundle argued in The Sunday Times that the inclusion of Badoer and Romain Grosjean in the race was dangerous, since new rules that ban further testing until 1 January 2010 mean that they have been unable to gain the experience necessary to race. Badoer had never driven the Ferrari F60 before, having last tested the Ferrari F2008 at the Autódromo Internacional do Algarve in Portimão, Portugal in December 2008. Elsewhere, Brundle stated: "It is surprising to some that Ferrari has not elected to use fellow tester Marc Gené who once stood in pretty successfully at Williams. The problem is that, with the testing ban for 2009, none of the test drivers are really up to speed. I personally would have tried a sharp and fit up-and-coming star of which there are many around". During his race commentary, Brundle suggested that Ferrari should use Massa's absence to give a potential future star a drive. Badoer made up six places at the start of the race and ran 14th on the first lap before he was hit from behind by Grosjean and spun. 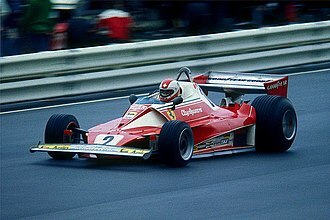 He eventually finished in 17th place out of 18 finishers, posting a fastest lap which was faster than both Toro Rossos. Ferrari team principal Stefano Domenicali indicated after the race that Badoer would keep the seat for the Belgian Grand Prix. At the Belgian Grand Prix, Badoer again qualified last after a spin on his last lap of the first qualifying session. At the start of the race, Badoer avoided the accidents on the first lap and finished in 14th place, last of those drivers to finish the full race distance, despite setting the fastest sector one time of the race. Badoer was replaced by Force India driver Giancarlo Fisichella starting at the Italian Grand Prix, although over the five remaining races of the season he also failed to score any points. Badoer blamed the negative media coverage of his driving for Ferrari's decision to replace him. At the end of 2010, Badoer retired from Ferrari as test driver and was replaced by Jules Bianchi. He ended his 12-year role at Ferrari with a demonstration of the Ferrari F60, the car Badoer raced in 2009 on a Ferrari-themed day at the Bologna Motor Show on 8 December 2010. He also took part in a forum for Gazzetta dello Sport, where he stated his only regret was that he "was only able to do two races [for the Scuderia]". In January 2011, Badoer drove the Ferrari F60 with a special livery on the ice of the Madonna di Campiglio for his final act with the team. Badoer's son Brando currently competes in the WSK karting series. ^ "Luca Badoer". Sky Sports. 2009-09-03. Archived from the original on September 26, 2009. Retrieved 2009-10-02. ^ "Why it's still hard to make your point in F1". Autosport.com. 18 September 2011. ^ "Luca Badoer". StatsF1.com. StatsF1. Retrieved 23 September 2011. ^ a b Everett Tadeo, Patrick (2009-08-12). "10 little known facts about Luca Badoer". BBC Top Gear Philippines. Retrieved 2009-08-23. ^ "Luca Badoer". Formula 1. Archived from the original on August 21, 2009. Retrieved 2009-08-23. ^ "Luca Badoer". Driver Database. Retrieved 2009-08-23. ^ a b "Luca Badoer - Biography". Shell Motorsport. Archived from the original on August 29, 2009. Retrieved 2009-08-23. ^ "Citroen first to China in marathon rally raid; and MSA crowns champs in series finales at Del Mar". AutoWeek. 1992-10-19. p. 54. ^ Spurring, Quentin (1992-12-21). "F3000". AutoWeek. p. 49. ^ "Alesi: Salo is wrong choice". Crash.Net. 1999-07-16. Retrieved 2009-08-23. ^ a b Noble, Jonathan (2009-08-11). "Ten facts about Luca Badoer". Autosport. Retrieved 2009-08-23. ^ "Luca Badoer". Crash.Net. Archived from the original on February 3, 2010. Retrieved 2009-08-23. ^ Mackin, Bob (2006-02-13). "6,000 kilowatt ceremony". Canoe.ca. Retrieved 2009-08-23. ^ Arace, Michael (2006-02-11). "Games begin with a bang". The Columbus Dispatch. 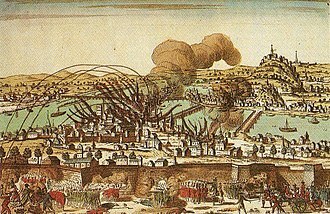 p. 1. ^ Eason, Kevin (11 August 2009). "Journeyman Luca Badoer rewarded for loyalty". The Times. London. Retrieved 11 August 2009. ^ "Schumacher calls off F1 comeback". BBC Sport. 11 August 2009. Retrieved 11 August 2009. ^ "Badoer set to race for Ferrari in Valencia". Formula1.com. 11 August 2009. Archived from the original on August 13, 2009. Retrieved 11 August 2009. ^ Benson, Andrew (2009-08-23). "Schumacher rules out race return". BBC Sport. Retrieved 2009-08-23. ^ "Badoer, Luca". Formula 1. Archived from the original on July 14, 2009. Retrieved 2009-08-23. ^ Llewellyn-Stevens, Gareth (2009-08-23). "Ferrari's F1 gamble on Badoer in Massa's car is doomed for disaster". Sportingo. Archived from the original on August 26, 2009. Retrieved 2009-08-23. ^ "Valencia results: Qualifying". BBC Sport. 2009-08-22. Retrieved 2009-08-23. ^ a b c "F1 rivals defend Badoer's 'good job' in 'impossible' situation". Crash.Net. 2009-08-23. Retrieved 2009-08-23. ^ McKenzie, Bob (2009-08-22). "Badoer's fine and Button's dandy". Daily Express. Retrieved 2009-08-23. ^ "Luca Badoer excited by Ferrari chance ahead of European grand prix". The Guardian. London. 2009-08-19. Retrieved 2009-08-23. ^ Brundle, Martin (2009-08-23). "Unprepared substitutes put lives in danger". The Sunday Times. London. Retrieved 2009-08-23. ^ Noble, Jonathan (2009-08-11). "Mixed feelings for Badoer about call-up". Autosport. Retrieved 2009-08-23. ^ "Luca Badoer". BBC Sport. 2009-08-21. Retrieved 2009-08-23. 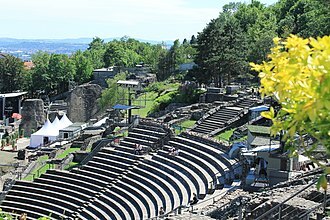 ^ "The European Grand Prix: Part 2". Formula 1. Season 2009. 2009-08-23. BBC One. ^ "Valencia results: Full race timings". BBC Sport. 2009-08-23. Retrieved 2009-08-23. ^ Strang, Simon (2009-08-23). "Ferrari to keep Badoer for Spa". Autosport. Retrieved 2009-08-23. ^ "Qualifying analysis – Fisichella fastest, but not lightest". Formula 1. 2009-08-29. Archived from the original on August 31, 2009. Retrieved 2009-08-31. ^ "Spa-Francorchamps results: Full race timings". BBC Sport. 2009-08-30. Retrieved 2009-08-31. ^ "Belgian Grand Prix: Winners and Losers". PlanetF1.com. 2009-08-30. Archived from the original on September 4, 2009. Retrieved 2009-08-31. ^ "All drivers' best sector times: Round 12 Belgium". Everyday F1. 2009-08-30. Archived from the original on 2011-07-28. Retrieved 2009-08-31. ^ Noble, Jonathan (2009-09-03). "Force India releases Fisichella to Ferrari". autosport.com. Haymarket Publications. Retrieved 2009-09-03. ^ Beer, Matt (2009-09-06). "Badoer says media forced him out". Autosport. Retrieved 2009-09-13. ^ a b "Badoer bids emotional farewell to Ferrari". Formula 1. 2010-12-09. Archived from the original on December 11, 2010. Retrieved 2009-12-09. ^ a b "Badoer: "An emotional day"". 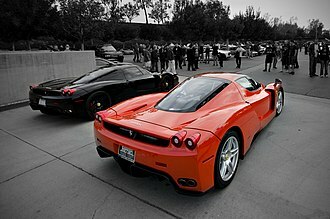 Scuderia Ferrari. 2010-12-08. Archived from the original on December 11, 2010. Retrieved 2009-12-10. ^ "Badoer honoured: on the ice with the F60". Scuderia Ferrari. 2011-01-11. Archived from the original on January 14, 2011. Retrieved 2011-04-08. ^ "Jarno Trulli's son makes WSK karting debut". March 4, 2017. Retrieved March 4, 2017. Wikimedia Commons has media related to Luca Badoer. The 2009 European Grand Prix was a Formula One motor race held on 23 August 2009 at the Valencia Street Circuit in Valencia, Spain. It was the 11th race of the 2009 Formula One season, the race was contested over 57 laps, an overall race distance of 303.9 km. 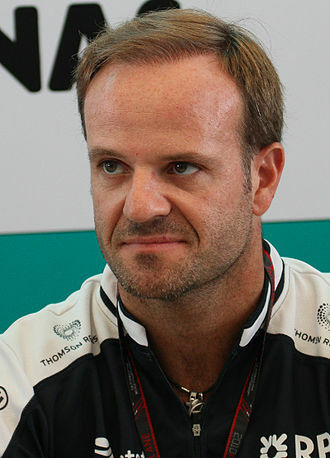 The winner was Rubens Barrichello for Brawn GP after starting third on the grid. The 2008 world champion Lewis Hamilton finished second for McLaren-Mercedes, while 2007 world champion Kimi Räikkönen finished in third for Ferrari. Championship leader Jenson Button finished in seventh for the race in a row. It was Barrichellos first Grand Prix victory since the 2004 Chinese Grand Prix while he was driving for Ferrari. He marked the 100th victory for a Brazilian driver in F1, hamiltons second place granted him another podium, while Räikkönens third place was his second podium in a row. The race saw the debut of GP2 Series driver Romain Grosjean and he replaced Nelson Piquet Jr. at Renault. This race saw the Grand Prix return of Luca Badoer who had not raced since the 1999 Japanese Grand Prix and he replaced the injured Felipe Massa at Ferrari. Also, Timo Glock scored his first, and Toyotas last, fastest lap, Brawn GP still lead the Constructors Championship by 15.5 points from Red Bull Racing, with a further 58.5 points separating them from defending champions Ferrari. Ferrari had jumped Toyota after Kimi Räikkönen has finished 2nd place in the previous race, Lewis Hamilton of McLaren-Mercedes won the last race in the championship,4 weeks previously in Budapest for the Hungarian Grand Prix. He qualified 4th on the grid and won the race in dominating style to take his first race victory since the 2008 Chinese Grand Prix, hamiltons win marked the first victory for a car equipped with KERS. Kimi Räikkönen earned second place, his best result of the season and this however was only his second podium and his fourth points scoring finish of the season. Mark Webber finished third, Jenson Button finished 7th, and Rubens Barrichello came 10th while Sebastian Vettel retired because of suspension damage, Felipe Massa dominated the 2008 race, leading 50 of 57 laps from pole and setting the fastest lap in the process. Andrea Montermini is an Italian racing driver. Montermini raced in Formula 3 in 1989, taking place in the Monaco GP support race. He moved up to Formula 3000, racing for three season before taking second place in the 1992 season, winning three rounds while driving for the Il Barone Rampante team. He participated in 29 Formula One Grands Prix, debuting on 29 May 1994 for Simtek, replacing Roland Ratzenberger, Montermini himself crashed heavily in practice for the 1994 Spanish Grand Prix, breaking his left heel and his right foot. He returned to Formula One the next season, with the Pacific Grand Prix team, Montermini was rumoured to become a test driver for the MasterCard Lola team, but it folded after one race in 1997. He scored no points in his Formula One career and he competed in the American Champ Car series three different seasons, 1993-1994 and 1999. He scored a 4th place at Detroit in his first season, in 1999 he drove a few events for Dan Gurney in Gurneys last season of team ownership. The 1993 Italian Grand Prix was a Formula One motor race held at Monza on 12 September 1993. It was the round of the 1993 Formula One season. The 53-lap race was won by Williams driver Damon Hill after he started from second position, jean Alesi finished second for the Ferrari team and McLaren driver Michael Andretti took third place. The Williams cars had once again dominated qualifying, locking out the front row with Prost on pole, jordan had originally intended to replace Boutsen with their test-driver, Emanuele Naspetti, but he had turned the opportunity down. Two separate incidents saw 5 cars eliminated at the first chicane, apicellas debut – which would turn out to be his only Grand Prix start – had lasted no more than 800 metres, unofficially making him the driver with the shortest career in Formula One. Midway through the opening lap Schumacher passed Alesi to take second position, Prost led Schumacher, Berger and Brundle into lap 2. On lap 8 Sennas race went from bad to worse and he was up to seventh and in an attempt to take sixth place from Brundle, he collided with the Brits Ligier, his second collision of the day, and eliminated the both of them. Prosts championship ambitions had been given a major boost with Sennas retirement, Hill was now up to sixth place with the elimination of Brundle and Senna. Hill caught and passed Alesi on lap 18 to move into position and on lap 22 he found himself in second place when Schumachers engine expired. He was now 5 seconds adrift of his team-mate, by lap 48 Hill was only 2 seconds behind Prost but Prost seemed to have enough time in hand to cover his team-mate. But, on lap 49, with less than 5 laps to go and this allowed Hill to take the lead and win the race with Alesi in a fine second ahead of Andretti, Wendlinger and Comas. The finish of the race provided Formula One with one of its most spectacular moments, the Minardis of Pierluigi Martini and Christian Fittipaldi had approached the chequered flag line astern when Fittipaldis left front wheel made contact with his team-mates right rear wheel. The contact launched Fittipaldis car into the air where it did a near perfect back flip before landing back on its wheels, neither driver was hurt and both finished the race without losing a position. Pierluigi Martini is an Italian former racing driver. He participated in 124 Formula One Grands Prix between 1984 and 1995, Martinis uncle, Giancarlo Martini, raced during the 1970s, including some non-championship races in a Ferrari 312T entered by Scuderia Everest, a team owned by Giancarlo Minardi. Pierluigis younger brother, Oliver, is a racing driver, Martini participated in 124 Formula One Grands Prix, debuting on 9 September 1984, driving for Toleman in place of suspended Ayrton Senna at the 1984 Italian Grand Prix. He scored a total of 18 championship points and was synonymous with the Minardi team, aside from a single outing with Toleman and a one-season dalliance with Scuderia Italia, Martinis entire career was spent with the Italian outfit. However, Martini was one of the drivers who tended to ignoring blue flags, on both occasions Martini was called in for a 10 second stop and go penalty for ignoring blue flags. 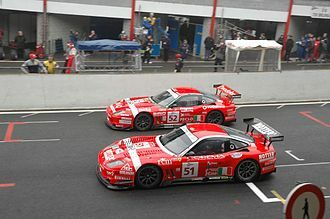 After Formula One, Martini started a successful sportscar career and his first race at the 24 Hours of Le Mans was in 1996 with a Porsche run by Joest Racing. Formula Two had become too expensive, and was dominated by works-run cars with factory engines, the hope was that Formula 3000 would offer quicker, more open racing. The series began as a specification, tyres were standardized from 1986 onwards, followed by engines. The series ran annually until 2004, and was replaced in 2005 by the GP2 Series, Formula 3000 replaced Formula Two, and was so named because the engines used were limited to 3000cc maximum capacity. Initially, the Cosworth DFV was a choice, having been made obsolete in Formula One by the adoption of 1.5 litre turbocharged engines. 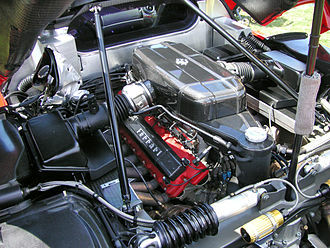 The rules permitted any 90-degree V8 engine, fitted with a rev-limiter to keep power output under control, as well as the Cosworth, a Honda engine based on an Indy V8 by John Judd appeared, a rumoured Lamborghini V8 never raced. In years, a Mugen-Honda V8 became the thing to have, eclipsing the DFV, not unlike the senior series, were getting out of control. The first chassis from March, AGS and Ralt were developments of their existing 1984 Formula Two designs, although Lolas entry was based on and looked very much like an IndyCar. The form book was rewritten in 1988 with the entry of the ambitious Reynard marque with a new chassis. Dallara briefly tried the series before moving up to Formula One, at least one unraced F3000 chassis existed—the Wagner fitted with a straight-six short-stroke BMW. This was converted into a car, however. The series was not without controversy, definitive rules for the 1985 season did not appear until the championship was well under way. In 1987 questions were asked about the ability of some of the drivers, in 1989 the eligibility of the new Reynard chassis was challenged - it was raced with a different nose to the one that had been crash tested. This season saw problems with driver changes - the cost of F3000 was escalating to the point that teams were finding it difficult to run drivers for a whole season. A badly implemented two driver changes per car per season rule meant that cars had to sit idle while drivers with budgets could not race them. In 1991 the performance of some Italian teams attracted attention - they had started using Agips jungle juice Formula One fuel, worth an estimated 15 bhp—giving their drivers a significant advantage. Mika Juhani Salo is a Finnish professional racing driver. He competed in Formula One between 1994 and 2002 and his best ranking was 10th in the world championship in 1999, when he stood in for the injured Michael Schumacher at Ferrari for six races, scoring two podiums. He won the GT2 class in the 2008 and 200924 Hours of Le Mans, in 1989, Helsinki-born Salo competed in the British Formula 3 Championship, racing for Alan Docking Racing. He raced with the Reynard Toyota package which was not the seasons best, staying with Alan Docking Racing for 1990 and moving to a more competitive Ralt chassis, he raced against countryman and fierce rival Mika Häkkinen in Formula Three, finishing second to him. In 1991 Salo headed to Japan to race in the Japanese Formula 3000 Championship and his initial aim was to race in Europes Formula 3000 but did not garner enough funding to compete. A budget would have spanned from £200.000 to £500.000 to drive in Europe and Salo had only collected a fraction over £200.000, not enough to stay competitive. While in Japan, Salo landed a seat and got paid for driving for AD Racings in their single car team. The Japanese Formula 3000 Championship in 1991 had increased thanks to the aggrieved Johnny Herbert raising the calibre of the championship. After a few years racing in Japan he made his first Formula One start at the round of the 1994 season in Japan for the ailing Lotus team. He was kept on for the finale in Australia. Following the collapse of Lotus following the end of the season and he was to spend three years with the team, scoring points several times. In the 1997 Monaco Grand Prix he completed the race without refuelling, taking fifth place ahead of the faster Giancarlo Fisichella as a result. Despite a promising 1998 with Arrows, he had no drive in 1999. Following an injury to BAR driver Ricardo Zonta, Salo took his place for three races whilst the Brazilian recovered, however a greater opportunity arose when Michael Schumacher broke his leg in a crash during the 1999 British Grand Prix. The 2009 Hungarian Grand Prix was a Formula One motor race held on 26 July 2009 at the Hungaroring in Mogyoród,18 km north of Budapest, Hungary. It was the race of the 2009 Formula One season. The 70-lap race was won by 2008 world champion Lewis Hamilton for McLaren-Mercedes, the 2007 world champion Kimi Räikkönen finished second for Ferrari, with Red Bull Racings Mark Webber finishing third. Championship leader Jenson Button had a race to finish seventh. Hamiltons win was his first since the 2008 Chinese Grand Prix, the result marked the first time that a car equipped with a regenerative brake system had won a race. He replaced the fired Sébastien Bourdais at Scuderia Toro Rosso, heading into the weekend, Jenson Button led the Drivers Championship on 68 points for Brawn GP,21 points clear of Red Bull Racings Sebastian Vettel. Vettels team-mate Mark Webber, who signed a new contract before the race weekend, was 1.5 points behind Vettel. Brawn GP held the lead in the Constructors Championship, with a lead of 19.5 points from a resurgent Red Bull Racing, Toyota held an advantage of only 1.5 points over defending champions Scuderia Ferrari. Webber won the race in Germany from pole position, to claim his first win at the 130th attempt. Felipe Massa was third, to earn his first podium of the 2009 season to date, Championship leader Button could only muster a fifth-place finish, after being overhauled by the one-stopping Williams of Nico Rosberg, who finished fourth having started fifteenth. The Hungaroring had been the scene of the victories of Button, Alonso. Much of the prior to the weekend was about the appointment of Jaime Alguersuari to replace Sébastien Bourdais at Scuderia Toro Rosso. Alguersuari did not have any circuit testing experience in a Formula One car, Felipe Massa felt that Alguersuari — who had 118 prior single-seater races under his belt, with 17 wins — was too young and inexperienced to be driving a contemporary Formula One car. Mark Webber and Jenson Button expressed their fears about Alguersuari driving at the Hungaroring, Sebastian Vettel came to the support of the Spaniard, saying that he should take his time to build up speed. Romain Grosjean made his Formula One debut for Renault after the team's one-race ban following the Hungarian Grand Prix was overturned on appeal. Luca Badoer qualified last for his first Grand Prix in ten years. Fernando Alonso finished in sixth in front of his home crowd. Montermini at the Brands Hatch round of the 2014 Blancpain Sprint Series season. Montermini driving for Pacific Racing at the 1995 British Grand Prix. Montermini driving for Forti at the 1996 San Marino Grand Prix. Damon Hill was leading when his engine blew on lap 42. Ayrton Senna was classified fifth after running out of fuel on the last lap. Robert Kubica failed to make it out of the first part of qualifying. Fernando Alonso returning to the pits, after his Renault shed its right front wheel on lap thirteen. The church of Santa Maria in Colle.